On ​November 9th, Rocky Point High School Interact Service Club members together with their advisor, Mrs. Messinetti, and Rocky Point Rotarian, Susan Wilson, participated in a fall cleanup at Camp Pa-Qua-Tuck. 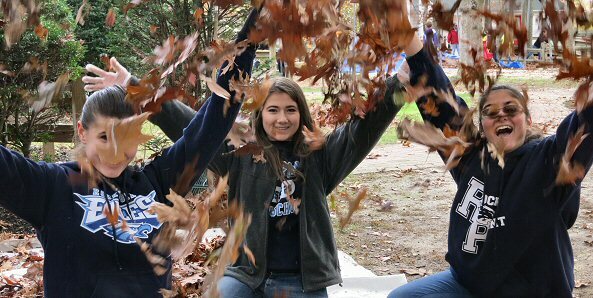 Everyone took part in raking leaves, moving picnic tables, and general cleanup duties. They worked hard, but they also managed to have fun. They were assisted by members of the Port Jefferson Rotary and Interact Clubs. Camp Pa-Qua-Tuck is a resident summer camp designed for young people ages 6-21 with special needs. Its mission is to help children and adults achieve equality, dignity, and maximum independence through a safe and quality program of camping, recreation, and education in a summer-time environment. Throughout the program, campers participate in typical summer camp activities, such as arts and crafts, talent shows, cook-outs, swimming and boating.